, student of the Middle Temple, bencher and treasurer of the Inner Temple, and keeper of the records in the Tower, was born in 1636, at a place called, in his Latin epitapir, Siorithes, near Skipton, in Craven, Yorkshire. 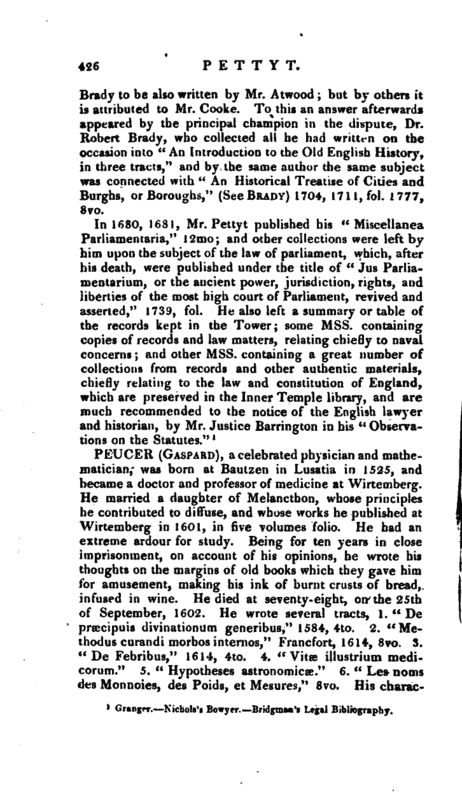 Of his progress through life we have no information, except that he enjoyed much reputation as a law-writer, and particularly as the collector of a very curious library, and many valuable Mss. now in the Inner Temple library. He died at Chelsea, Oct. 3, 1707, aged seventy-one, but was buried in the Temple church, where is a long Latin epitaph, recording his many virtues and his collections, donations, &c. It is probable Chelsea was his favourite residence, as the year before his death he built a vestry and school-room adjoining the church-yard, with lodgings for the master, entirely at his own expenee. In 1680 he asserted the “Ancient Rights of the Commons of England, in a discourse proving by records, &c. that they were ever an essential part of parliament,” 8vo. This gave rise to a controversy, in the course of which the following pieces were published, 1. “Jani Anglorum facies nova, or several monuments of antiquity touching the great councils of this kingdom and the courts of the king’s immediate tenants and otficers,” 1680, 8vo, said to be written by Mr. Atwood. 2. “A full Answer to a book written by William Pettyt, esq. with a true account of the famous Colloquium, or Parliament 40 Hen. Ill and a glossary expounding some few words in ancient records, together with some animadversions on a book called Jani Anglorum facies nova,” 1683, 8vo. 3. “Jus Anglorum ab antique, or a confutation of an impotent libel against the government by king, lords and commons, under the pretence of answering Mr. Pettyt, and the author of * Jam Anglorum facies nova,'” 1681, 8vo. 4. “Argumentum Anunormanicum; or an argument proving from ancient histories and records, that William duke of Normandy made no absolute conquest in England,” 1682, 8vo. This is thought by Dr. | Brady to be also written by Mr. Atwood; but by others it is attributed to Mr. Cooke. To this an answer afterwards appeared by the principal champion in the dispute, Dr. Robert Brady, who collected all he had written on the occasion into “An Introduction to the Old English History, in three tracts,” and by the same author the same subject was connected with “An Historical Treatise of Cities and Burghs, or Boroughs,” (See Brady) 1704, 1711,fol. 1777, 8vo. Granger. Nichols’s Eowyer. 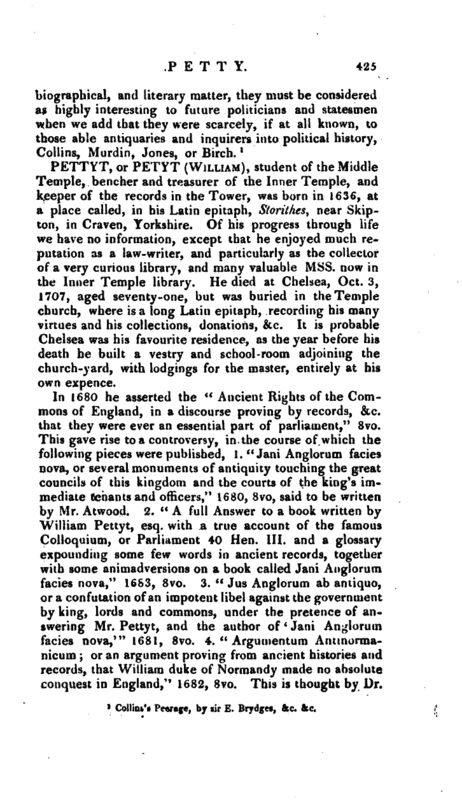 Bridg man’s Legal Bibliography.